I had been at Sierra Pacific Power Company for a year and a half before coming to TMWA [when Sierra Pacific sold the company to the local governments]. I was a water planning engineer. TMWA has three hydroelectric plants that we operate and maintain with a crew of six. On the diesels we have 40 generators maintained by two individuals. I supervise those groups. 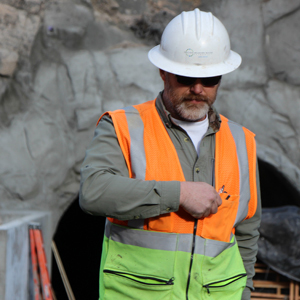 I also act as a project construction manager on the hydroelectric [infrastructure] projects, like the Fleish tunnel, Fleish penstock and Washoe spillway. Beyond that, I’m also the property maintenance supervisor. We have over 200 pump stations, wells, regs (pressure regulators), and tanks. We’re responsible for maintaining the grounds on those, including irrigation, maintenance on the buildings, roofs, painting, block walls, fencing, gates, all of that. So we take care of making sure all of those facilities are in good shape. I have been afforded so many opportunities in working on the projects we’ve done—the flumes and tunnels and working around the hydros. In my previous positon as a construction administrator I did a lot of work on pump station rehabs and [water] tank rehabs, putting in regs and helping out with the water distribution system … You learn so much from that, and I’m always wanting to learn new things as I go—and TMWA has provided me such great opportunities to form my career and advance my own knowledge. I think we’re pretty lean here as far as personnel goes. So there’s never a lack of anything to do. We keep very busy and there are a lot of days that I go home at a point where I just can’t do any more. I just shut off. I love putting in the hours, I love coming to work every day and doing as much as I can but there are days where you just go home having to accept that you’re out of sunlight or time—or whatever—and you just can’t get it all done in one day. The diversity in what I do, I think, is what I enjoy most. I do so many things. I’m proud of everything that we do—from providing the water and the quality of the water … the projects that I work on. At the end of the day, you feel like you accomplished something and you gave forth something that contributed to the overall mission. By far the Fleish tunnel has been the most interesting and challenging project I’ve worked on. Part of it was because we had such a great contractor. I learned so much. It was the best, most enjoyable experience I’ve had working with a contractor. It was a big project—a four-and-a-half million dollar project. Being the project manager on that, as well as being involved in it from its conception to its completion was amazing. The project addressed a section of flume along the river that was susceptible to landslides, flooding-damage and rock fall. It was also not accessible by road and, therefore, very difficult to maintain. We had a landslide in the past and it was over a million dollars to replace 300 feet of flume in this one section. So the decision was made to bypass that section completely and restore the river corridor back to its natural condition. We built 1,167 feet of tunnel to bypass that flume section. Now we have a much more robust water-conveyance system there than we did before. I’ve been a section hiker on the Pacific Crest Trail since 1978. It’s a 2,650-mile long trail. My plan is to finish the last 350 miles of it this summer.